Loved this rug mat. Good quality. Keep rugs perfectly positioned with this Con-Tact Brand Movenot rug pad. Just place the felt pad underneath your existing rug to prevent slips. The reversible design features a non-skid latex backing for hard surfaces such as hard wood, and a smooth felted surface on the reverse side for use on carpet. 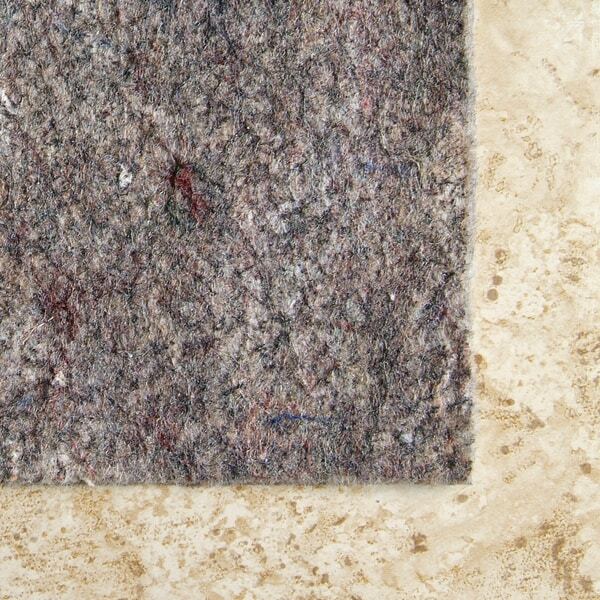 Great under low-pile rugs, the felt pad prevents wrinkles for a smooth appearance. Cushion footsteps for a quieter and more comfortable home. The extra padding also reduces wear-and-tear in high traffic areas, so your rug lasts longer. Made from felt, the synthetic material holds up to heavy use and has antimicrobial properties from plant oils for fewer odors. Easy to handle and very easy to cut to fit my area rug. 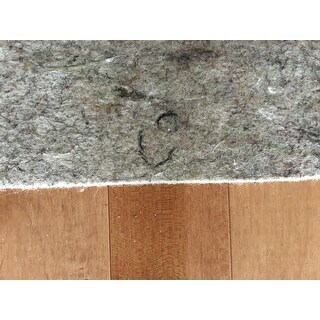 You can see by the photo this is a densely woven hunk of rug pad. Also note the size is 10 X 14'. You can can't use a skinny pad for a heavy rug. It will slide, slip, shift and wear faster in the traffic areas. In this case it was a beautiful thick Heriz from Overstock. It came folded like a BIG blanket, in a clear thick vinyl square bag. It flattened in less than 30 minutes with a few creases left, none of which affected the flatness of the rug. The rug has been in place (literally) for over 2 years now. It hasn't budged. It was well priced, especially with my O discounts and rewards. This pad is great for any hard surface or carpet - bought two for the versatility and ability to use where ever I need to place a rug without having to buy multiples. I am happy! Amazing rug pad. This is a total, fully grip pad. I put a jute rug on top and the rug did not move at all. I also had to cut down the pad slightly and it was very easy to cut. It is on the thinner side (probably around 1/8") but since my rug was so thick it didn't matter to me. Would recommended if you are looking to hold down any type of rug. I ordered a few of these pads. They are thinner than I expected so they do not add any noticeable cushioning under rugs, but they do the trick of keeping rugs in place so I'm satisfied with them. Inexpensive 2sided pad. Holds well on wood floor. Not very thick at all so if you need cushioning, this is probably not the one for you. Not so cushion but keep it and does the job. Doing it's job! Rug hasn't moved and floor looks the same after a year. Thickest pad that works for both carpet and hard wood. priced in a local store and decided to search on line for a better price. I saved 100.00 plus! Thank you! "How thick is this pad?" Hello solyluna8, the pad is .375 inches thick. Thanks for shopping with us!